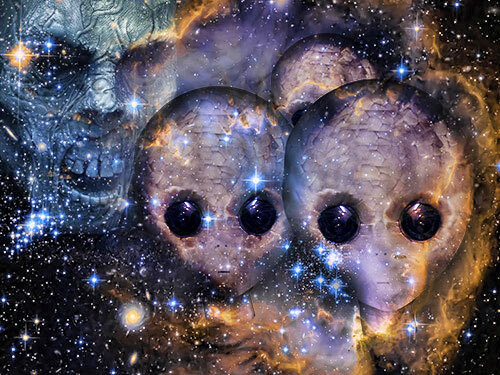 Much of what we know about aliens comes from what abductees and contactees themselves report. Only when such information is factual and relevant can meaningful conclusions be reached. Fabrication, hallucination, and screen memories obscure the truth, and so various protocols exist to improve the signal to noise ratio. These include cross-correlating multiple eyewitness accounts and using hypnotic regression techniques to bypass the memory blocks and screen memories installed by abductors. There is yet another source of noise, one not generally known but potentially widespread, which is the mimicry of alien contact by non-alien entities of an occult nature. Through telepathic means, occult entities have the ability to generate controlled hallucinations in the minds of their victims in order to reshape their beliefs and thereby control their behavior. Their ability to induce guided hallucinations in the vulnerable means that they can project whatever scenario and cast of characters they wish. That is not to say the latter are all a farce, just that OEs can mimic them to varying degrees. So the concern is that some individuals claiming alien contact may instead be under the influence of one or more OEs feeding them counterfeit experiences. Since they may appear sane and show no signs of intentional fabrication, one risks concluding that the contact is genuine and contributes to our understanding of the alien presence. To avoid this contamination of our knowledge pool, we must develop an understanding of occult entities how their abilities, limitations, methods of operation, and possible motivations compare and contrast with those of aliens. Naturally this concept goes against the simplistic idea that aliens are just demons in disguise, or that the demons of mythology were all just aliens. It's not that simple. Experiencers who endure both occult and alien activity may notice over time the various nuances that differentiate one from the other; both aliens and OEs exist as distinct categories. The more dots, the more revealing the picture. Toward that end, I have researched these and related subjects for over two decades and have corresponded with thousands of contacts who were kind enough to privately share with me their anomalous experiences. Being an abductee myself and having dealt with paranormal phenomena since childhood, I was able to personally verify or support much of what I heard from others or read in the literature. What follows is a distillation of that effort. ...who are foreign to our civilization. Some appear to be physical like ourselves while others are quasi-physical in that they normally inhabit a higher meta-reality beyond three dimensions of space and linear time and project themselves into our reality as required. The term "occult entities" (OEs) refers to non-alien autonomous intelligences lacking physical bodies. OEs inhabit nonphysical realms called by occultists the "etheric" and "astral" planes. The etheric plane is a boundary zone between the physical and metaphysical. It is a subtle energy medium that permeates, underlies, mirrors, and contains the physical universe. Not only does it contain etheric copies of physical objects, anchored in space and time to those objects, but it also contains etheric entities and constructs that have no physical counterparts. The astral plane, on the other hand, is an entirely metaphysical plane of consciousness that has little correspondence to locations in our spacetime continuum. As living human beings, we have not only physical bodies, but also etheric and astral bodies. The latter together comprise the soul. The more sentient OEs inhabit the astral plane in their native, weakened, or dormant state. There, they can affect us mentally and emotionally because our astral body extends into the astral plane. If an OE also acquires sufficient etheric energy, it can then condense for itself an etheric body and inhabit the etheric environment, meaning it then establishes a localized presence near the physical plane. And if it gathers even more energy, it may even begin affecting things physically as seen in the poltergeist phenomenon. Like humans, most aliens have tangible bodies requiring protection and upkeep, and so they too require shelter, transport, clothing, and technology. Discarnate OEs, on the other hand, have only the growth and diminution of their subtle energy bodies to worry about, and so they concern themselves with stealing etheric and astral energies from the living in order to sustain their own form. OEs don't require special suits, underground bases, flying crafts, or a host of technologies to carry out their agenda. Rather, they operate more via occult, magickal, or metaphysical principles. If OEs ever do display clothing, they tend to be malevolent human discarnates symbolically projecting silhouettes of human items such as brimmed hats, capes, and long coats. Whereas aliens are physical or quasi-physical and therefore have biological bodies, OEs are discarnate and have no physical bodies, let alone genetics. Succubi and incubi are OEs known to etherically stimulate a target sexually, but this is more a form of sexual energy harvesting whereas certain alien abductions also involve harvesting the biological products for their hybrid breeding projects. Out of necessity, aliens are much better versed in physical sciences and engineering than OEs. Unlike OEs, they possess real knowledge and equipment that can be shared with select human groups. For instance, the astras (celestial weapons) of Hindu mythology and Ark of the Covenant in Judaic mythology trace back to times when alien groups gave their human proxies certain extraterrestrial artifacts to help them carry out their missions. Same can be said today with allegations of human shadow military groups receiving alien technology in exchange for allowing or assisting with alien abduction of the citizenry. Unlike aliens, OEs only seem capable of providing imitative or caricaturized "science" and "technology" that are nothing more than props to flesh out their deceptive storylines. There is no novel objective logic behind these props or what is observed of them, anymore than one could derive workable technology from the set of a science fiction movie. They seem to pull their ideas from our collective consciousness, whether by observing our thoughts or by drawing on memories of having previously been human. Keen experiencers may note that the average OE is never as intelligent or sophisticated as the average alien. ...that enhance their ability to interface with our world. Strong OEs have telekinetic abilities and can generate poltergeist phenomena, their strength being derived from the amount of lifeforce energy they feed upon. They can also generate electric and magnetic anomalies that induce mild interference in electronic devices up to and including electronic voice phenomena. Aliens, by comparison, can do all this and also shut down car engines, stop video and audio recorders, and deactivate nuclear missiles; their ships can show up on flight radar as anomalous blips, generate loud humming noises and modulated vibrations, leave ground traces, emit bright multicolored flashing lights, and can be seen by multiple eyewitnesses dashing off into the distance at incredible speeds. Aliens can even levitate and dephase an abductee through solid walls and closed windows via their infamous blue light beam technology, or quarantine the abductee's local section of spacetime from surrounding spacetime in order to carry out an abduction in isolation from outside perception or even memory. OEs only have parlor tricks in comparison. Both aliens and OEs are capable of performing soul abductions. In the case of OEs, it occurs via one or more shadow-like humanoid forms literally tugging and pulling the soul out by the head, feet, or arms. In alien soul abductions, alien entities may telepathically induce an OBE and then usher the individual toward an awaiting ship; another reported method involves a kind of vortical tractor beam swirling the soul up and out to the ship. And whereas alien soul abductions then progress into a structured set of procedures such as programming or etheric implant installation, OE abductions are more a crude form of soul snatching with the goal of severing the connection between soul and body in order to hijack the body simply kill the person in his or her sleep. While little is known about what happens after a successful OE abduction, a number of individuals have recounted failed attempts where they managed to fight off these "shadow people" and return to their bodies. It appears that only aliens (and military abductors) can perform physical abductions. OE "abductions" are either soul abductions or induced hallucinatory experiences. In other words, OEs cannot make a person's body disappear for a period of time, let alone return it in strange locations or positions or with clothes on backwards as is typical of botched alien abduction return procedures. So a camera or third party observer will see an OE target remain in bed the entire time, or perhaps engage in some sleep talking or sleep walking at most. Note that aliens can also induce artificial hallucinations, better known as "virtual reality scenarios" in this context, but they are not limited to that, for they can also take the physical body up into a craft or to an underground, underwater, or orbital base. 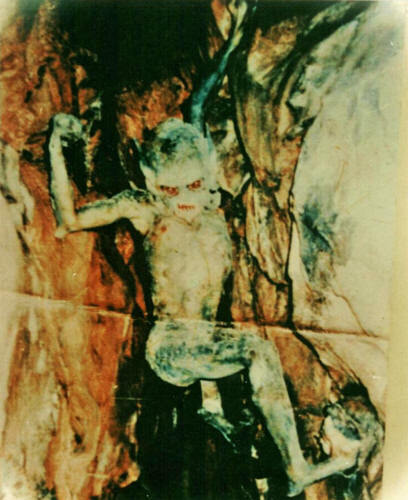 Further, alien and military abductions or night visitations can leave physical marks on the body including bruises, scars, punctures, scoop marks, burns, cuts, unusual soreness in suspicious areas like behind the ears or in the reproductive regions, and lumps under the skin from subcutaneous implants. OEs can only affect the body through telekinetic and etheric effects that alter biological processes. However, OEs would not have the means of producing scoop marks, permanent scars, or solid implants that are removable via surgery. And it goes without saying that OEs also cannot create pregnancies with fetuses that vanish after the first trimester. 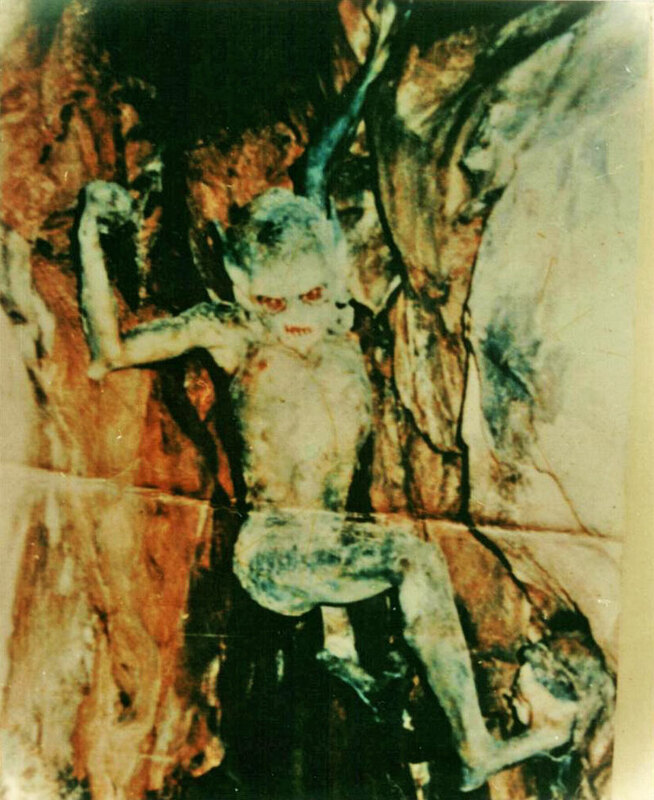 Victims of occult parasitism may not have prior history of alien abduction, and so they will lack the associated signs such as a history of nosebleeds, childhood memories of abductions or visitation, irrational childhood phobias of objects or animals resembling the Greys or Reptilians, post traumatic stress syndrome from unremembered abductions, and the aforementioned bodily marks. Alien abductions tend to start in childhood or infancy and continue for life, whereas OEs being more opportunistic can enter one's life suddenly during teenhood or adulthood when the entity chances a moment of psychic vulnerability. Another important difference is that aliens rely heavily on screen memories and memory erasure to cover up what actually happened during an abduction or visitation. This implies that something objective and tangible took place that must stay hidden. OEs on the other hand are not generally known to use screen memories or memory erasure techniques, probably because they lack the ability to affect our mind-body system with sufficient depth, knowledge, and precision. The best they can do is psychically interface with the target and generate artificial hallucinations in real time, including dream manipulation, so that the individual perceives or dreams one thing while in the entity is actually doing something else like plugging into his etheric subsystems and siphoning life-force energy. To illustrate, if a person were to awaken or snap out of such a state, he might then notice a startled OE hovering or stooping over him. The difference between this and alien screen memory is that the latter can be installed after the fact to retroactively cover up a real memory, while OEs seem to manipulate perception solely as the event occurs. Again, aliens can do the latter but they can also do what OEs cannot. Aliens prefer to hide their tracks; an abductee would ideally never remember that something happened unless the abductors see strategic value in letting certain things be remembered. Due to alien diligence, someone can go decades without ever realizing he or she is an abductee. Aliens are working strategically toward some bigger goal and deniability is an important part of maintaining operational security and preventing temporal paradoxes or instabilities. OEs are less careful. They are opportunistic predators interested in energy feeding and spiritual control; sometimes that necessitates traumatizing a target or loading his mind with a false storyline that gets him/her caught up in their game. That entails intentionally producing an experience that sticks with him and preoccupies him. The only track OEs cover is their true nature, which is that they are really demons or malevolent ghosts and not ascended masters or spirit guides or members of the Ashtar Command, that their ulterior motive is food and control. In fact, many OEs make it a point to take up as much psychological space as possible in the minds of their targes, like a parasite consuming its host bite by bite, while aliens typically seek to minimize that space or compartmentalize it away unless the goal is to create a disinformation vector or zealously cooperative subject. This ties into the next point, which is that aliens are logistically limited in number, mobility, and time by having to coordinate the timing of their abduction and contact operations for various reasons. This means that aliens come and go; their activity is sporadic and calculated, and sometimes years can pass before they return for another visit. The entity attaches its nest to walls, corners, furniture, anything that has an extension into the etheric plane and can hold an etheric charge. In this way, over time the OE builds a kind of base that allows it to stay close to the target with minimal energy loss to the environment. One example would be a nest hanging from the ceiling down toward where the target sleeps. With enough time, an entire building can become infested with OEs who thereby acquire free reign to move about within at leisure. Instead of coming and going like aliens, OEs can be there all day every day. In cases of localized nesting, one giveaway is that one's vital energy, dreams quality, mood, and mental coherence all improve when changing location. For example, one correspondent who had for years dealt with tormenting voices by a particularly demonic class of OEs experienced significant relief after her apartment caught fire and she had to move to a new place. The new home was not yet nested by the OEs and so she was free of them for the time being. To go from 24/7 attention to little or no attention simply by moving a few blocks is highly uncharacteristic of alien contact, but highly suggestive of an OE presence. In addition to setting up nests, OEs also try to worm their way ever deeper into a target's mind and soul with the goal of full possession. Then they can control the target from the astral plane regardless of where he or she travels. Now, there appear to be metaphysical laws in place and instinctual defense mechanisms in human beings that prevent OEs from doing this to just anyone and everyone at any time, which is why they have to be selective in whom they choose. To get around some of the metaphysical laws that bar them from more deeply exploiting their targets, OEs frequently seek the target's permission to enter them. This can be done by way of trickery or wearing them down until they lose the will to resist. "may I enter?" or "so you give us permission to enter?" or where they repeat hypnotic commands such as "let us in" until the target gives in. Another OE tactic involves dangling bait, perhaps a serendipitously induced hallucination or sensation that catches the target's interest and piques his curiosity until he willing reaches out for whatever is at the other end of that mystery. That also amounts to giving permission. Whatever the case, if the target agrees, then protective barriers fall away and the OE rapidly gains control of the target's biological-etheric perceptual pathways. The resulting voices, sensations, dreams, and/or visuals then work to mislead or torture the target toward spiritual destruction. Aliens can also spin such false storylines and induce virtual reality scenarios telepathically, but the difference is that they do it for strategic reasons that go beyond spiritual control and energy feeding. For instance, they might need to create a disinformation vector to write a book or website serving their agenda in some way. Or they simply seek to create smoke (multitudes of contradictory nonsensical storylines) that obscures the signal of what they're really up to. Their efforts are generally not as sadistic or spiritually poisonous as what OEs engage in, at least not in the short term, because negative alien factions seem more concerned with manipulating the destiny of our planet and shaping the timeline for their benefit. That requires affecting our understanding and perception of them more than anything. Thus psychological or informational warfare comprises their more ubiquitous activity on this planet. So whereas OE false storylines are concocted tales filled with spiritual disinformation to achieve spiritual control, alien false storylines use alien disinformation to achieve alien control of this planet. These two aren't mutually exclusive and blend in the middle, but one can reasonably make the generalization that aliens and OEs are acting on separate planes of action, one more physical and temporal, the other more metaphysical and spiritual. Again, this follows from alien still being physical or quasi-physical and OEs being completely discarnate and having only matters of the soul or spirit to worry about. No matter how vivid and involved the hallucinated experience, none of what's seen demonstrates objective physical interaction with the local physical environment since all of it plays out in his mind. What objective aspects do exist merely confirm the presence of OEs. At best these include poltergeist/EVP (Electronic Voice Phenomena) activities, third party witnessing of shadowy nonphysical entities haunting the premises, and the sighting of dark humanoid figures standing nearby or black forms floating/swirling overhead. No sign of physical procedures having been performed on the individual, such as physical implants, anomalous scars and markings, phantom pregnancies, history of nosebleeds, radiation sickness and conjunctivitis, etc. Any marks left on the physical body are solely those explainable by paranormal trauma including etheric energy burns that look like bruises or localized allergic skin reactions from foreign etheric energy contamination. Elaborate storylines may be given that contain too many elements drawn from the target's own fantasies and wishful thinking mixed with convenient and creative fabrications by the entities. Due to the wealth of hallucinatory experience accumulated by the target, he or she soon becomes an "expert" in the delusional paradigm fed to him or her. For alien-style storylines invented by OEs, these may be full of large casts of characters, exciting dramas, galactic histories, personal involvement of the target in fanciful space battles and missions, and whatever else keeps the target entertained and ego-engaged. These storylines contain nothing of practical value, verifiability, novelty, and truth since they are just fantasies with a spiritually disinformative twist. The paradigm in question contains directionality only insofar as it is tailored to ensnare the target, weaken him spiritually, and perhaps promulgate spiritual disinformation concerning matters of the soul, the afterlife, and the sovereignty of the human spirit. The more successful deception operations lead to human hosts going on to become cult leaders or channeler of these entities, thereby allowing the parasitical OEs to infect and feed upon a wider captive audience. Other storylines are designed to play on the target's paranoid tendencies and drive him to insanity, homelessness, suicide and death. OE influence can begin suddenly without a prior history of alien abduction or contact. It may start with a minor anomalous event like a voice, unusual dream, bodily sensation, short hallucination, or haunting event that captivates the target like bait on a hook. After the target pursues this and donates enough of his energy, the entity may go in for the kill by asking for permission to enter, and then hallucinatory experiences skyrocket. The target may eventually come off as schizophrenic, though unlike true schizophrenia the phenomenon stops completely if the entities are banished or simply move on to another target. Also, unlike medical schizophrenia, these cases are usually accompanied by some level of paranormal activity witnessed by third parties. If occult entities exist, might they have an interest in imitating aliens? Yes, if that is what provokes a cooperation from a modern mind. Obviously they cannot imitate fairies, leprechauns, or gods with as much success as they once had. Due to aliens acclimating the public to their existence, the UFO phenomenon and alien presence has saturated our cultural zeitgeist during the 20th century to such a degree that we now generally find them to be the most plausible otherworldly possibility. Accordingly, occult entities would have had to change their marketing to swing with the new beliefs. But what gives them away is the intangibility of their hallucinatory projections and the lack of intrinsic logic and objectivity behind their sham contacts and fake ships. Occult charades, along with aliens themselves using screen memories and false storylines to cover up their activities and generate disinformation, has lead some to believe that the entire UFO phenomenon is nothing but a joke played on humanity by interdimensional tricksters. But these two interwoven strands (alien and OE) can be separated through diligent research and deduction. Archeological, mythological, and genetic research  reveals the existence of an underlying objectivity and tangibility to the alien presence throughout human history. Ancient observers describing advanced technologies that made no sense them and therefore could not have been projections of their cultural expectations, yet which begin making sense to modern investigators armed with knowledge of quantum, hyperdimensional, and transdimensional science. Or, consider the anomalies in the human genome suggesting we are genetically modified organisms, if not outright genetic creations by some primordial founder race. None of the preceding examples can be credited to today's ghosts, demons, and astral parasites who simply lack the technology and tangibility to accomplish such feats. But that doesn't prevent them from imitating aliens crudely, fancifully, and ostentatiously by telepathically interfacing with a gullible subject and spinning for them an elaborate belief system. So we must be mindful of what these beings can do, what they cannot do, and thereby detect when a potential abductee or contactee has been caught up in a case of occult entity deception. If a case is questionable, then we should be proportionately more cautious and discerning about drawing from it any conclusions about the alien presence. 3. Fore, My Experiences (Grey, Pleiadeans and Oddities - web archive: http://montalk.net/fore.zip). Barbara O'Brien, Operators and Things: The Inner Life of a Schizophrenic (Cambridge: Arlington Books, 1958).